Another excellent and thoughtful review, just like Emma’s. I do enjoy my damaged women on the edge, so it sounds like a shoo-in read for me (once I’ve done my #TBR20). I’ve liked everything I’ve tried by Joan Didion so far – but it’s been mainly non-fiction, so I want to try her fiction too. Oh, yes, afer a few like that I need a much lighter read! I’ve only ever read The Year Of Magical Thinking but this does sound like a must go the ‘books I really need to read’ pile . I would definitely encourage you to try some of her fiction. Technically speaking, I think Play is the more accomplished of the two novels I’ve read so far, but Run River is the one I’d love to revisit. I’m tempted to say start there as it’s a good entry point. Magical Thinking is on my shelf, but I’m going to have to work up to it as it’ll be a difficult read for me, possibly a little too close to the bone. I do want to read it though…it’ll be a question of finding the right moment. I read this many years ago and it’s stuck with me. Didion’s writing is so good. I like how you describe it as being raw but so polished – that feels exactly right. Yes, I can well imagine it being a difficult book to shake. I found it hard to switch off from reading this one as several of the images cut right through my mind. She’s an amazing writer, isn’t she? I just want to read everything she’s written. Some non-fiction next, I think! As always Jacqui, I like the way you recaptured the characters you read, especially when you reviewed Didion’s books. She seems to excel in describing troubled characters and difficult life, like the ones in Run River. I’ve read several of Didion’s non-fiction books but never a novel so must add this one to my list. Her writing is extraordinary – I like your description of it’s sharp intensity, Jacqui. Thanks, Susan. I need to swap with you as I’ve yet to make a start on her non-fiction! I did treat myself to a couple of her essay collections as part of my post-TBR20 binge, so there’s no excuse now. I think Play is an excellent novel, but by God it’s an intense and disturbing story. It’s incredibly impressive stuff though as Didion’s writing is just so damn good. Run River is a much quieter story, more melancholy in tone, and it’s the one I’d love to revisit at some stage. Perhaps best to start with Run River, then. I think you nailed it with your piercing image. Let me know your thoughts if you do get a chance to read it. I’d be interested to hear how you think it compares to some of her non-fiction. This sounds great. I love the line that you quoted. Among many things that sound interesting, I cannot imagine how bad it would be to be stuck in such an institution knowing that the doctors had no idea as what they were doing. Thanks, Poppy. You have to read to her at some point and let me know what you think. She’s very strong on mood and that awful sense of detachment. I don’t know how she manages to convey so much in so few words…it’s really quite remarkable. Great. Well, good luck with your third attempt – you’re over the halfway hump so not too far to go now! That’s a nice selection of writers you’ve got there. I loved Elizabeth Taylor’s Mrs Palfrey (as you know), and her short stories are meant to be fab. Spark is on my list too. Enjoy! Excellent review Jacqui. I’ve read a *lot* of Didion’s books and loved them – but they’ve all been non-fiction! I would love to read her fiction, and I imagine it’s all quite hard edged. She’s a formidable writer. Thanks, Karen. Yes, very much so…formidable is a great description. Play is definitely the more intense of the two I’ve read so far. It’s razor-sharp and makes for uncomfortable reading at times, but it’s an excellent novel nonetheless. Fantastic review, Jacqui. It gives a really good vision of the book. I agree with you, it’s good to start with Run River before reading this one. I’m not so severe with Carter in my billet but I think you’re right. He’s ruthless and part of Maria’s problem comes from him. However, living with Maria must have been a challenge too. Some parts are really difficult to read for a woman, I think. The novel has an incredible sense of place. You can feel the 60s and all the descriptions and references to the Californian landscape add to the atmosphere. It also shows a dual California: you’ve got the rural / early settlers side from Maria’s family and past (like for Lily and Everett in Run River) and the glamour side with Maria’s marriage and new friends in Hollywood. Thanks, Emma. I’m really glad we started with Run River before reading Play. I have you to thank for that as your excellent billet hooked me right in! Didion’s sense of place and period is amazing, isn’t it? Great point about the contrast between the different facets of California…I loved your commentary on the connections between the two novels. Which of the two did you prefer? My head says Play is the better novel, but my heart is with Run River. Great review. I can see how this novel would make for quite horrowing reading. Joan Didion is a new name to me I confess. Thanks, Ali. It is a disturbing story, not something you’d want to read if you’re feeling a bit low. She’s an amazing writer, definitely worthy of investigation. Excellent post, Jacqui. Though I haven’t read this in years, it still sticks out as one of the great Los Angeles novels. That quotation you pull describing the landscape of the L.A. freeway is absolutely spot on. When I lived in L.A. Play It As It Lays even served as something of a fetish. It’s still impossible – probably for any Angeleno who’s read the book – to merge from the 101 South to the Harbor Freeway without thinking of Maria’s obsession with trying to cross all the lanes in one uninterrupted movement – not nearly as easy as it sounds. You might be interested in a not very good film – Welcome to L.A., by Alan Rudolph (and produced by Robert Altman) – that nonetheless has a Play It As It Lays type atmosphere and also features a Maria-type character (played by Geraldine Chaplin) – or rather Maria if she were older – who spends her days riding around the freeways (albeit in taxis). Thanks, Scott…and thank you for such a great insight on Los Angeles. I’ve never been, but Didion’s descriptions of the landscape and terrain seem so clear-eyed that it doesn’t surprise me to hear they feel authentic to you. Right then, Welcome to L.A. is going straight on the DVD list before I forget. Cheers for the recommendation as it’s not one I’m familiar with but it sounds like a great match for the novel. Have you seen the film adaptation of Play It As It Lays, the one with Tuesday Weld as Maria? Didion co-wrote the screenplay so it must be worth a look (unless you say otherwise!). Dislocated, fractured, absolutely, spot on. Great landscape quote too. I’m delighted you liked this one, it’s simply superb isn’t it? Carter is interesting. Mostly we see him from Maria’s perspective, and I doubt she’d be easy to live with. I can imagine Maria being exhausting, or perhaps better draining. Such a great novel. Well worth a re-read some day. Thanks, Max. Her descriptions of the landscape are so vivid; it’s the same in Run River (I hope you have that somewhere in your TBR). I thought Play was extraordinary, incredibly impressive…a real tour de force. There are similarities with Lispector’s Near to the Wild Heart (the fractured nature of the narrative; the sense of isolation in the marriage; the awful feeling of detachment), but I preferred Play. I would reread it, definitely…perhaps in five or ten years time to see how it stands up. Mind you, my heart is with Run River, that’s one I’d love to revisit – you have to read it (I’ll stop nagging now). Maybe I’ve been a bit hard on Carter, and it would have been interesting to hear a bit more about the early years of his relationship with Maria. There are so many gaps in the narrative, but I think Didion knows what she’s doing there. In some ways, I wonder if those interruptions add to the intensity by serving to sharpen the impact of the things we do get to see? I think the power comes from the omissions. Without the white space it wouldn’t be nearly as interesting. I definitely agree that Didion knows what she’s doing with the gaps. It just underlines her skill as a writer, doesn’t it? I’d like to try some of her non-fiction next, but there’s also A Book of Common Prayer to consider. Just checked the tweets from our twitter conversation with Gilly a couple of months back and she placed Common Prayer ahead of Play in her order of preference for Didion’s work. It sounds increasingly like a must-read. I have a thing for books set in asylums/mental institutions, but I’m not sure I’d like this. I have Run River to read first anyway, and then I’ll see what I think at that point. I loved Run River – glad to hear you have it in your possession as it’s a great place to start with Didion’s fiction. There are some similarities between the two novels in terms of their themes; both feature a woman isolated in her marriage, for instance. That said, they differ a fair bit in tone and style as Run River is a much quieter, more melancholy novel than Play. I have Didion’s essays and have never thought of her as a fiction writer – but your excellent review shows me I should! I rather like the women-on-the-verge-of-a-breakdown genre, though it seems maybe a bit much to have both mother and daughter as troubled souls? Though that’s probably realistic! There’s a lot of love out there for Didion’s non-fiction (which I still need to get to!) but I’ve been very impressed with the two novels I’ve read so far. It’s getting to the stage where I just want to read everything she’s ever written. Yet more praise for Didion – looks like I’ll have to read her (though I am attempting a pause in my book buying at the moment). Yes, you must, although I can relate to the pause in book buying! Funnily enough, certain aspects of Play reminded me a little of Clarice Lispector’s Near to the Wild Heart, especially that awful feeling of detachment and isolation. And there is a sense that both Maria (in Play) and Joana (in the Lispector) are merely existing rather than participating in life in a broader way. 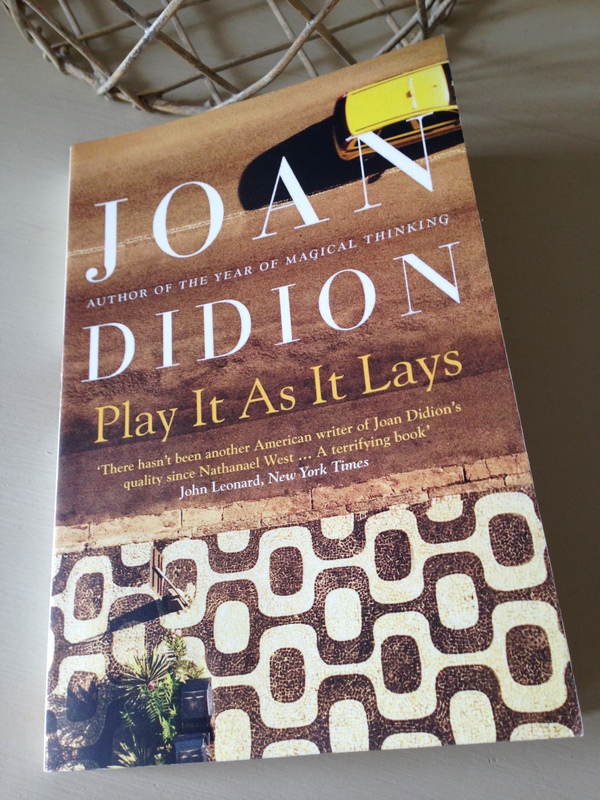 I love Didion, but I’ve tried to read her fiction before and it’s just not clicked (which made me sad, because I wanted to love it) – maybe Play It As It Lays would be a better start. I think it’s a remarkable novel, but it is very intense. I’d love to know what you make of it should you decide to give it a shot. Which of her other novels have you tried? On the non-fiction front, I found her Miami very impressive. Pre-blog I’m afraid. Great piece of reportage though. Ah, well. Noted. In the meantime, I’ve just finished Of Love and Hunger, definitely in my top three of the year so far.